Why wait to expose your kids to Shakespeare? Introduce them with the help of "The Tiniest Tempest"! Picture this: A Shakespeare classic adapted for kids' enjoyment, with the potential of jumpstarting their appreciation for the infamous English playwright. Sounds good, right? 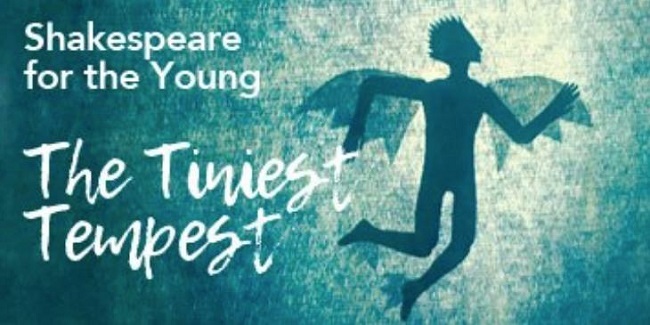 Then, hurry and buy your tickets for The Tiniest Tempest -- a play specifically for your tiniest Shakespeare fan in training! If you haven't read The Tempest, here's a brief, less-than-Shakespearian description of the plot: On a remote island, Prospero -- the rightful, but exiled duke from Milan -- wants to restore his daughter, Miranda, to her rightful position. And he decides to do this using magic. Then, with a bunch of hocus-pocus, he conjures up the storm that the play is named after, which causes Prospero's title-usurping brother, the easily-led King of Naples, and his son to be stranded on Prospero's island. And if you've read any of Shakespeare's other plays, you can imagine the shenanigans that ensue after this event! Although we can't promise that these same shenanigans will ensue in the tot-friendly version of the play, we can promise that your kids will be fascinated by the three actors wearing big body puppets, some shadow puppetry, and live and recorded music made especially for the play! What do you think your kids would think of The Tiniest Tempest? What do you think of Shakespeare plays being adapted to entertain a younger audience? Drop us a comment below! We sat down with the cast and crew of The Folger Theatre's "King John." Read all about it here. OCN Watchlist: 'Game of Thrones' Trailer, Amanda Seales' Comedy Special, and More!